As always, I’ve made some slight changes in gear. 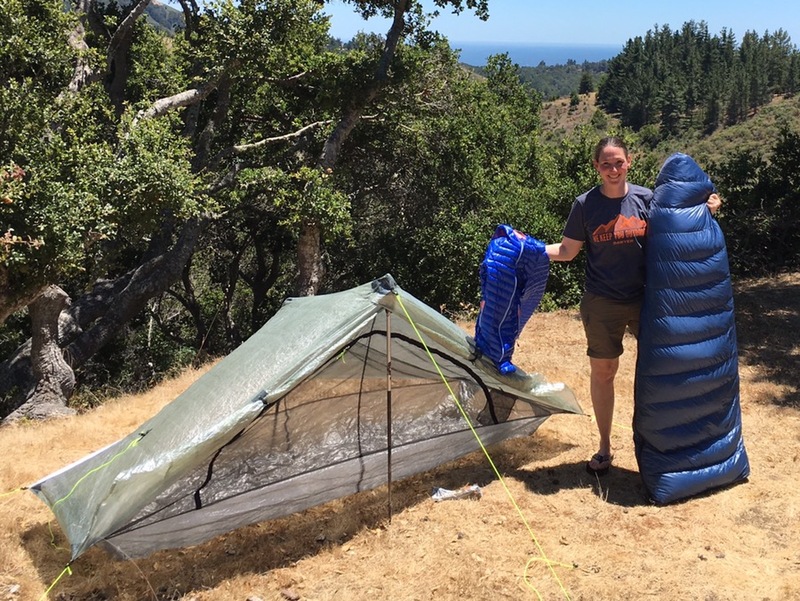 I’m a lightweight backpacker, but by no means am I ultralight. I realize I could definitely go lighter, but I do have some luxury items that are worth carrying for me personally. Some of you may recall that at the end of the Great Divide Trail last year, I sent home much of my gear from Canada and accidentally had it left on the porch for 24hrs…when it was stolen. It wasn’t terrible, but it was definitely annoying to repurchase so many tiny items (brush, spoon, stakes, headlamp, mosquito head net, etc). I had kept many of the major big ticket items with me in case the package got lost, but it was over $1,000 in gear that I had to replace, and one of the items was my GPS, which was unintentionally put in the box. Very annoying and a lesson learned the hard way about shipping packages. Overall, with added gear for snow(ice axe & microspikes) and bears (bear canister), my base pack weight for the Sierra High Route is 16lbs 12oz. Check out my gear list for a full listing of my gear with links, prices and weights (we are still working to get all the links on there). So fast forward to today. Since my slate was clean, I was able to buy many of those tiny items I normally wouldn’t have since I already had something that was sufficient. Here is a photo of the small items that are new to me. The rest have remained the same, but I just had to buy new ones. 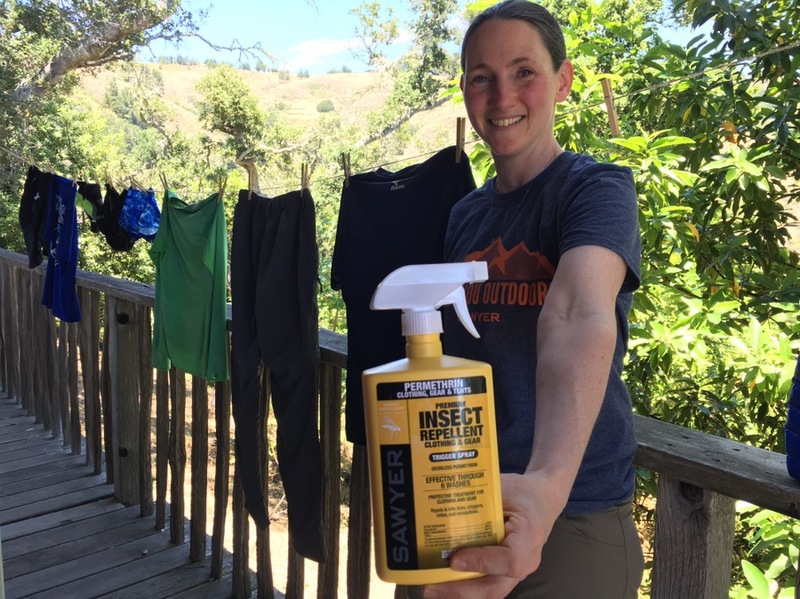 Sawyer Picaridin Bug Spray: Amazing and no DEET! Petzel e+Lite Headlamp: Not as bright as others and thin cord rather than a band, but very light and does the job for use around camp. I don’t think I’d love it for night hiking. Tite-Lite Titanium Stakes: Very strong, yet light. Anker Astro E4 13000mAh external battery: My new brick that should charge my phone up to 7 times(gotta be able to watch shows at night!). Sooo bummed to have lost my old battery that is no longer in production. La Sportiva Bushido (Mens): I’m trying these out after Rockin’s recommendation and the face that the Solomon Cross Max shoe that I loved last summer is discontinued. We will be in the heart of mosquito season in both the Sierra High Route and the Wind River High Route. DEET is a horrible thing, so Sawyer makes amazing products that are not harmful to skin or gear and actually works! They have been a reliable product for years used by the US military and even majorly in combating the Zika Virus. Their Picaridin bug spray I mentioned above(short stock due to Zika), and they also have Permethrin, which is used to treat gear and clothing. I got all that done today and will be very happy when we hit peak mosquito season! Yes, you’ll notice I’m not in Portland. I’m visiting friends in Big Sur and will post more on that in my next post! It has also been two full seasons that I’ve had the same tent (ZPacks Solplex), sleeping bag(ZPacks 10 degree), and down jacket(Mountain Hardware Ghost Whisperer). They have held up great since 2014. I took them on 6 trails, 4,300mi, (slept in the tent 200 nights). The trails I took them on were the Appalachian Trail, Long Trail, Great Divide Trail, Tahoe Rim Trail, Hayduke, and the Lost Coast Trail. I feel like all these items still have another season to eek out of them and I will still take them on some trips, but I was kindly offered new versions of each and they are great! A huge THANK YOU to David for this amazing gift! Finally, I have two more items that were kindly shipped to me. One is my reliable Gossamer Gear Mariposa Pack. Man, I do love this pack! It has served me well since I started using it in 2013. Gossamer Gear made some improvement to the design a year ago to improve the arm straps that irritated some people and they are now super comfy. This year, they now have improved on the hip belt (more ergonomic), hipbelt pockets (more functional), and the stays in the back are now integrated into the hipbelt for ultimate load transfer and comfort(going to be awesome when scrambling on high routes). The other item is that the WoolPro has kindly sent me items from their newest line of wool clothing. 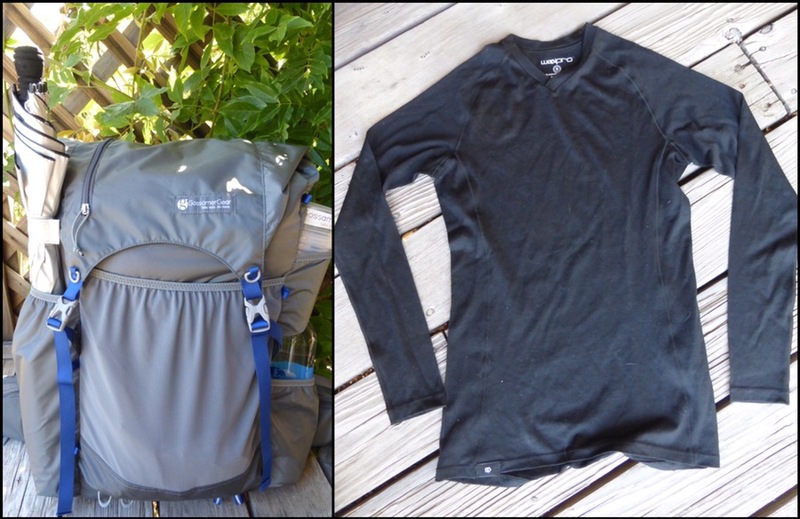 I now have the lightweight baselayer Skylark top (for pajamas and cold mornings under my hiking clothes) and the lightweight leggings are on the way. They are advertised as the lightest baselayer on the market and are just launching this whole new line that is ideal for lightweight backpackers or anyone that uses wool in an active lifestyle. Of course, I want to be sure to thank those of you that have contributed to these items and the companies that have kindly sponsored me. 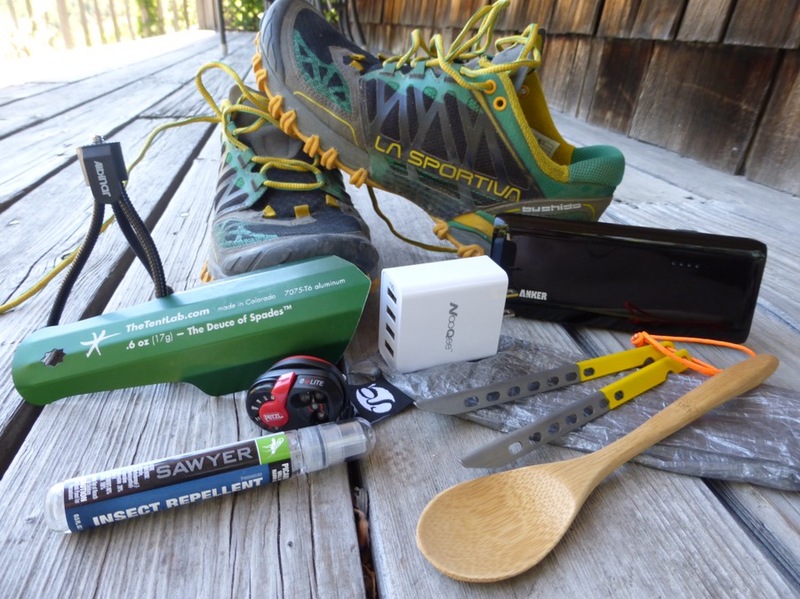 Gossamer Gear, Sawyer, Dirty Girl Gaiters, StickPic, TrailDesigns, and WoolPro. All of these companies know that I’m not a walking commercial and appreciate that I only use gear that I truly use and stand behind. So that’s the update for this coming year. On the next post, I’ll talk more about my personal anticipated excitement and challenges that lie ahead this summer. Big Sur is a great place to hike. If you wonder any further South (Morro Bay) dinner is on me. Ah man, if I were I’d have taken you up on that offer. Heading east to meet Rockin’ & Why Not to start the SHR. I’ve been following your travels for a few years now and just want to let you know how much I appreciated your blog! I know you put a lot of work into it. A few weeks ago I got out to Glacier National Park for some camping and day hikes and I probably never would have done it without the inspiration I have gotten from you. I’m super excited to follow your upcoming journeys! Your new website looks great too. Dawn, that’s just a boost to hear that. I love Glacier and it really intimidated me before I visited I ended up loving it. So glad you went! You’re going to love having that tripod, I love mine. The Deuce is the best and Anker products rock. Have a great hike! I love posts on gear! Just three days to go, yaaaaa. I hate writing them, but can see they are the most viewed posts, and I know how much they help people, so it makes it worth it! With your smile, Wired, I doan need no steenkeen orange juice to start my day! Looking forward to your many exploits this year. Be careful out there Wired. I’m sure you will continue to be a huge inspiration to us this summer! aaaand, you’re off! I’m looking forward to following you (and Rockin) through another adventurous summer. You’re an inspiration! Good luck on your upcoming hikes! Your gear is dialed in – excellent choices. I would be wary of being overly optimistic of your external battery, they do not deliver the mAh as described, they only provide about 65% of the rating (as do all external chargers) – you might want to test this ahead of time. Aug 1 I start my last PCT segment (Wash). So glad I started following you on the PCT in 2011! Mike! Sooo happy to hear from you! That’s good luck for me to see this before we start. I better get emailed a finish photo at the Canada border. Really excited for you. That’s a great section (once you get up by Mt Adams). I am aware of those dang batteries. My old NewTrent was really solid. This was the next best thing. I’m glad I have a shorter first leg to test it out. Have you used a Pedco UltraPod tripod before? Wins hands down over the spider leg style. Have fun this year. I’ll be up high in the northern Winds (after the high route heads to down to the Green) a few weeks after you. I’ll have to check that out! I think it is weight I was most focused on. Do you know how much it weighs? It does look cool. 1.7 oz (46-47 g) on my scale. I love the swivel head and the velcro strap. The combination have allowed me to take any picture I’ve wanted. At least with a Canon S100, you can rotate it over to portrait orientation without tipping. I’ve attached it to trees, fences, flag poles and a trekking pole (either like a stick pic or jamming the pole in for longer distance selfie). Far more versatile than the spider one I had before (though it was a generic cheap one). Pretty cool. I may have to try it. This one has been fun and now I’m hooked on having one! I love our Anker! I use it all the time, when we are on adventures! It charges up fast, and works multiple times on my electronics, so I have a ready camera in my phone at all times! So ready to read your blog again! And you’re hiking with Rockin’ and Why Not? so I’ll get a triple dose of the stories! Can’t wait! It’s pretty fun to see it from all angles that way!